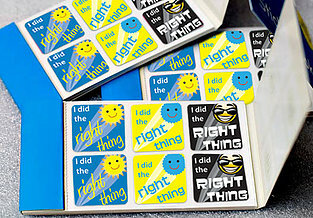 At the heart of the question/ answer process is one goal: using the phrase “Just Do The Right Thing” to set a moral and performance standard to help create “Success in the Moment.” Students live in the moment, and making good decisions now, moment by moment, establishes a vital life skill that paves the way for long-term success. Academic instruction isn’t the only responsibility teachers have in today’s classrooms. More and more, teachers are beign called on to teach students about values…. things like making good decisions, the showing of respect, taking responsibility, choosing friends, and having a positive attitude. 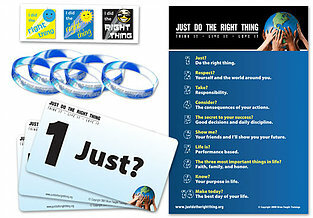 The “Just Do the Right Thing” program is a practical and powerful tool that equips teachers to tackle values training with confidence. A question interrupts an unwanted behavior and the answer suggests a more suitable, positive behavior. The questions provide an opportunity for students to have input into the decisions that affect them. By verbalizing responses, students are basically telling themselves what to do. By practicing the Just Do the Right Thing principles, students are conditioned to pay attention to what they are thinking in the moment and how these thoughts affect their behavior. Verbalizing/self-directing is the start of them taking ownership of their actions. Daily repetition instills accepted life principls that will guide students to make the right decisions. One of the best advantages for teachers who use the program in the classroom relates te discipline. The overarching goal of “Just Do the Right Thing” in the classroom is to create “Success in the Moment.” When students learn how to “start at right” in their moment to moment decisions, they greatly increase their chances for continued, long term success. By its very nature, a question prompts thoughts and reflection. When you stop and think, even for a moment, you have a better chance of making the right decision. Repeating information is a proven way of strengthening learning skills and remembering important information. The focal point of Just Do The Right Thing in the Classroom is a list of ten core principles delivered in an easy to use question / answer format. The process couldn’t be easier. Teachers simply ask the questions every day and the repetition gives students a clear understanding of expectations. This allows them to firmly internalize the principles and act upon them when necessary. Pattern interrupt is a powerful “classroom management” tool. The appropriate question interrupts an unwanted behavior and the corresponding answer suggests a more suitable behavior. But because the student verbalizes the answer, they are participating in the decisions that affect them. They are self-directing, and it gives them CONTROL over what happens next. This is the first step to them taking ownership of their actions. People, even children, don’t argue with their own conclusions. When they SAY IT, they DO IT!